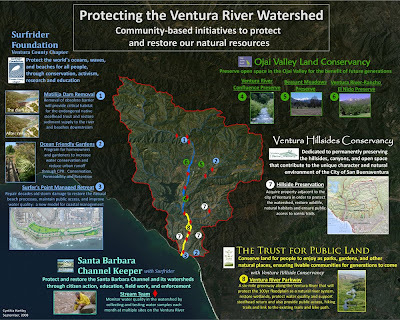 Our community is fortunate to have several very effective organizations whose combined efforts are making steady progress in watershed protection and restoration. Thanks to Cynthia, we have this poster ready in time for our Surfrider Foundation booth at the Ventura Hillsides Festival this weekend. She calls it the "Grand Unification Theory" - this was born from my realization that every year this event brings together local organizations, but the big picture of hillsides preservation gets lost in the details... I hope this helps illustrate the connections between all of these important local initiatives.